Here is a film that could quite possibly show up in a dictionary as an illustration of the term "slow-burn." The Blackcoat's Daughter is a puzzle movie whose pieces are put into place with patience and caution until a climax must allow the audience to put them together. Even so, it's more than a little frustrating how director Osgood Perkins's screenplay plays its cards a bit too early for the ultimate revelation to be much of a surprise. At some point in the puzzle, its solution becomes quite clearly the only one that makes sense, and then a sense of inevitability sets in. With that inevitability also comes a sense of routine. It's subtle, but once the observant viewer pinpoints said sensible solution, every piece of the puzzle that we receive feels obligatory. The film concerns events that surround three young women and the strictly religious institution that houses or has housed all of them at some point. Kat (Kiernan Shipka in a phenomenal performance) has been defined by trauma from a young age, after she and her father found her mother dead in a mangled and totaled vehicle on an icy street. 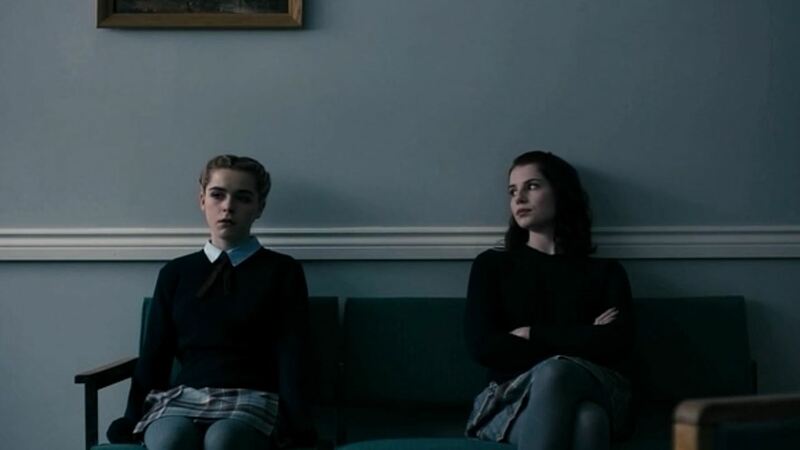 Rose (Lucy Boynton) has more typical, teen-aged concerns on her mind, such as the consequences of a fling with a fellow student that potentially left her with an STD. Joan (Emma Roberts) is a mysterious visitor into their midst, finding herself at the school on its winter break after hitch-hiking with a married couple (played by James Remar and Lauren Holly) who are a bit mysterious themselves. It seems a dark force is at work in this small town of Bramford. It is important to tiptoe around the film's events because so much of it is dependent upon a third act in which all of the relevant details are either called into question or made irrelevant by a screenplay that wants desperately to jerk its audience around. The performances alleviate some of the film's troubles, with Shipka leading the charge in an unnerving role that demands a lot from the actress. Boynton and Roberts are also good in reactive roles that are ultimately informed by the events of a climax that folds in on itself twice and redefines what we are supposed to have learned. The puzzle-like framing of the narrative is both innovative, in how it consistently restructures itself, and increasingly trivial, as the restructuring is built around a mystery that becomes less involving the weirder the story becomes. The film's ultimate impact comes from an atmosphere almost entirely provided by Perkins and cinematographer Julie Kirkwood's staging, framing, and compositing of sequences to be the eeriest that they can be. The snowy exteriors and blank, suffocating interiors are attractively captured and certainly reflect the hopeless goings-on in the school and around it. Unfortunately, the craft is wasted on a film that becomes a parlor trick with a last-minute bait-and-switch that undermines any and all of the good will that the film has built up in its solid foundation in characters. There are various questions to be asked during The Blackcoat's Daughter, but the one that we ask upon the end-credits roll is the most telling and important: Is that it?